Journeys to Joy: SHE'LL BE COMING FROM THE CANYON WHEN SHE COMES, SHE'LL BE COMING FROM THE CANYON WHEN SHE . . .
SHE'LL BE COMING FROM THE CANYON WHEN SHE COMES, SHE'LL BE COMING FROM THE CANYON WHEN SHE . . .
With trouble on their back trail from villains who want Shannon's map, the map she's using to prove her father's research isn't the work of a madman, that he really did find a treasure in the wild west. And with the dream of gold coloring every decision Shannon makes, and Gabe's surprising need to protect her, they set out to find a city of gold. Gabe finds Shannon stranded in a mountain top cave, left to die. Mary, What made you want to write? I don't really think of writing as something I do, more like what I AM. I have always written. My school assignments were too long. My letters home to Grandma were LONG. My children's baby books are covered with writing rather than pictures. It's not something I became. What do you use as inspiration for your books? Inspiration can come from anywhere. People-watching, playing 'what if' games. Movies, books, TV. Funny things the kids say. It's startling when it hits you, wow, that would make a great book if only. . .
Do you know ahead of time how your books are going to end or what you are going to write about next with the book in a series? Or, do you just go with the flow and hope it all comes together in the end? I sort of know because to end the book well, you need to bring it full circle and usually have the hero or heroine or both face up to their deepest fears or greatest failures. And that is often rooted in how you begin your book. So, the beginning creates the ending. And in between the beginning and ending, I just shoot people and have run away stage coaches, and the occasional passionate kiss. What do you do to keep yourself in the right frame of mind when writing your books? I enjoy writing so much, I think I'm really low maintenance when it comes to writing. I can get distracted, deal with the distraction, then go right back to the book and pick it up. No frame of mind is required. What is the ultimate dream you want to conquer with your writing? My prayer when I am writing is that God will make my words say more than I'm capable of having them say. That I will respect this precious gift I've been given of having my books published and do work worthy of the blessing. You often write about country girls and historical romance. Have you ever considered writing a different genre? Or ever had ideas for a book of a different genre? I have ideas all the time that jump around different genres. Always romance, but not always historical westerns. But I do dearly love them, and that's what's selling now, so I'm going with it. I have a great idea fro a time travel book and a suspense concerning a messed up chat room situation, and another with a cell phone kicking off the trouble. I can't do those in historical westerns. Although the time travel does go back to western times. How did you come up with the story ~ DEEP TROUBLE ~? Barbour Publishing was focusing on setting books in fascinating places and I wondered about several cool locations. I set one near Mount Rushmore and that seemed to work well. Researching different ideas, I found a really wonderful book written by a man who hiked the length of the Grand Canyon. I realized how little I knew about that famous place and decided to explore it through my book ~ Deep Trouble ~. If you didn't make it as a writer what would you be doing right now? I'd still be writing. I can't seem to stop. I seriously suspect I'll keep writing until I die whether anyone wants my books or not. Do any of your characters have a little piece of you in them? I write really tough, plain spoken frontier women who never get pushed around. That is the exact opposite of me. I think I create characters who are like I WISH I was rather than who I am. I have a pretty good sense of humor but I mostly keep it to myself . . . to the relief of all who know me. Do any of your characters have resemblance to characters you have crossed paths with in real life? For the most part, real people are too sane. Sometimes I find someone who gives me a jumping off spot, but I usually have to exaggerate that character until they lose all resemblance to real people. If you got to be a character in a novel, movie or on television or if you got to write yourself into one of your books; what type of character would you want to be? What genre would it be in? Well, since this is fiction, I'd be young and slender and maybe I'd know karate. And I'd like to drive a snazzy car too. And eat all I want without getting fat. Who would that be? Maybe Mrs. Peel on the old Avengers TV show, (not the movie). I really love Belle Tanner in my book - THE HUSBAND TREE. But I know how badly I'd miss air conditioning, so I wouldn't want to be her. Mary, this has been an amazingly fast interview. I wish you could stick around for longer. I'm also going to be sure to get those other books that are just perking under the surface - sure to come out one of these upcoming months. Thank you, Mary! 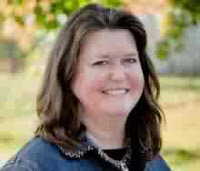 Mary Connealy writes fun and lively romantic comedy with cowboys for the Inspirational market. Mary is a Rita Award and Christy Award finalist. and has four grown daughters and two spectacular grandchildren (yes, she has pictures available upon request). Mary can be found at the following sites ~ Doing what else? Writing, of course! LEAVE A COMMENT - LEAVE YOUR EMAIL ADDRESS IN THE COMMENT- IF YOU WANT TO BE IN THE DRAWING! WINNER WILL BE NOTIFIED ONLY BY EMAIL AND HERE ON THE BLOG. =] What can I say, I love Mary's books. They're more than just fluff and they make me laugh (a big requirement!!). 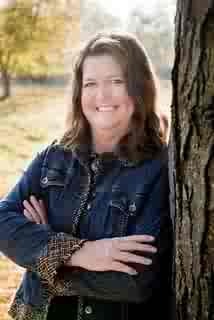 I'm looking forward to meeting her at the ACFW Conference in St. Louis this year - what fun anyone will have around her, don't you think? I would love to win a copy of this book! I look forward to reading it! Thanks so much for the giveaway! Love all of Mary's books and would absolutely love to win this one. Thanks for having me on, Joy. I had so much fun writing this book. If you're really interested in the Grand Canyon, try reading The Man Who Walked Through Time by Collin Fletcher. It's not really a normal impression of the canyon because he goes places no one else every will, but it is fascinating and really gives you a feel for what it's like down there. I wanted to go so badly, go down to the bottom. Take one of those mule rides maybe. But I don't think I'd make it. Even the mule rides are really strenuous and I'm pretty sure it would kill me. Here's somethign interesting about the canyon, if you die hiking down, they just leave you. They have no way to carry you out of send in a chopper, no water except what you carry. They'll send someone back for you but they've got to walk on out first. They're not kidding that it's rustic!!!! Love Mary's books and want this one ....so much! Always enjoy a Mary interview, too! Joy, you usually DO! LOL! I love the intimacy of your interviews, like sitting around the kitchen table having a cup of coffee and some donuts together....or pastries...or muffins...well, you get my drift! Nice to have you stop by Jackie, wfnren, Kari, and bp - Patty, it's great to have you back so soon - oh, just to leave an addy? Certainly can't forget that. If I made it to the bottom - I certainly die there - I can't imagine the trek down those trails. Seems like it'd be so hot down where the wind doesn't get a chance to cool one off. Whew, I think I'll enjoy my view from the top - if I don't get sick just being so close to an edge. You're each in the stetson for the drawing next Monday. Well, except you, Mary, but you wrote the book - you know how it ends! That's why I have her links all posted - she's got so much to have readers learn about her I had to add the sites she's on. Anyone interested in writing should read her posts on Seekerville and yes, those calf and cow pics bring back some awesome memories of my own and the farms I lived on. Mary is quite a character - her nail biting stories have comedic relief enough I've wondered if she practiced being a stand-up comic at some time in her early years. Thanks everyone for the interest you've shown in my new friend and fellow-writer. One look at my pic, Cheri, and you'd think I spent a lot of those 'over tea/coffee sit-arounds with lots of cookies, donuts, scones, cake and yes, I get your drift. Thanks for coming by and for leaving your addy to go in the stetson. not bRanding, cheri. banding. No R.
If you don't know what it is, just be a peace with that. You can live a full life and never know what banding is. Think tight rubber bands and voila a tiny baby bull calf becomes a steer. A woman's got to have her priorities. Hey, none of you are from Minneapolis are you? I'm doing a booksigning in Maple Grove AND Burnsville on Saturday. Details on my blog. that's Minneapolis suburbs. I always wish I could connect better with writers from the areas where I'm going. I KNOW there are a bunch of them. Minneapolis is too big for it to be otherwise. Your name has been placed in the stetson - will be drawing next Monday and will notify the winner by email. Funny, I'd not even thought about those who've not been associated with 'banding' confusing it in writing with 'branding' - you're right, Mary, for some I'm sure it's Too Much Information - I've had my chuckle for the afternoon. Hi, Joy! Thanks for hosting Mary, that was fun! Love Mary's work! 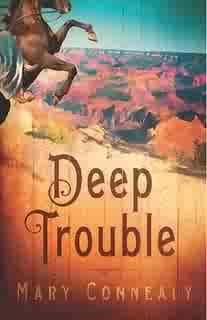 By the time you're done reading the book the characters feel like old friends :) I'm super excited to read Deep Trouble! Good morning. things are still really lively over here. Yay! I need lively. I'm nervous about driving to the big city of Minneapolis. and honestly, nervous is just common sense isn't it? I'm from a town of 600. I live on a gravel road. I do NOT enjoy multi-lane interstate highway systems. I love her books,Mary Connealy new meaning for laughter! Mary's books make me laugh and I can never put them down! Can't wait to read this one! I've enjoyed reading Mary's books, and would love to win this one! Her books are keepers. I am finally able to come back in and thank each of you for your great comments and you are each entered in the drawing - I have your email addresses all in the stetson. We still have until Monday morning to add other email addresses. The drawing will take place on Monday and the winner will be notified via your email addy. I honestly won't know the winner until my dh pulls the address from the hat for me. Stick around to see who the winner is as it will also be announced on Tuesday's blog posting. Joyfully anticipating the drawing - you're gonna love GABE! I don't know if the new Facebook rules will allow me to announce the winner of this drawing but I can at least direct my family and friends to see who has won over here at the Journal. Thanks for the chance to enter you contest! Would love to win this book, love Mary's books. It would make a great 40th Anniversary present for me, a day late, but a great gift. Okay. This has to be a God thing. For the past three weeks everywhere I go I hear the name Mary Connealy! Seriously - on the web, in the bookstore, at the writer's meeting ... the list goes on. I'm thinking it's time I add MC to my must read list. 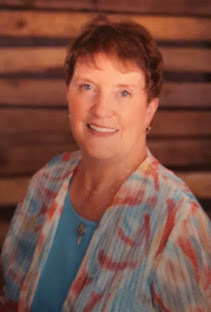 Thank, Joy, for your post and for the chance to win one of Mary Connealy's books. LOL! I MEANT Banding not branding...that's what I get for not reading it over before I send it! Ha Ha! We used to band our goats, back in the days but now I only make idle threats of such torture to the cat when he really makes me mad! LOL! Debbie, just a fair warning...once you read one you will be hooked! Thanks Joy for such a fun blog site where we can all enjoy the coffee and donuts...and laughter, and get to know each other better! Get that book ready - it's now 2:30PM EDT which means we only have what, 81/2 hours to go to the drawing? I've so enjoyed having you as my guest this week - my how this week has flown too. God has blessed me with additional followers and some great comments, don't you agree? Blessing as you write - be sure to stop back in when Joy's Joy~Ful Journal does the Spring~Blog~Fest Summary on June 14th - smack dab in the center of the June PROMOTION COMMOTION - I'll be sure to leave the light on for you, Mary! BE prepared - whoever wins - I will need your snail mail addy if you expect to receive the book once it's been one. email addy owner will send me the snail mail information and I will see to it Mary sends the winner the book - the great book - the everybody oughta have book! Out of fourteen email addresses in the stetson my dh woke in his recliner long enough to pull the numbered email from the hat. I'm going to let that person know and then will announce it to the public via my facebook page and back here later tonight. This has been a wild ride my friends and thank you to Mary Connealy for giving us such fun this week! YOU ARE NOT GOING TO BELIEVE THIS. MY DH HAS EITHER GOT A THING FOR MY NAME OR THIS BLOG HAS NO OTHER NAME IN MIND OR SOMETHING. JUMPFORJOY@GMAIL.COM - WINS THE BOOK - DEEP TROUBLE AND WILL BE RECEIVING A COPY FORTHWITH! I DOUBLE CHECKED THE NO. OF THE EMAIL HE CHOSE FROM THE HAT - WITHOUT LOOKING - HE DOUBLE CHECKED - IT'S GOT TO BE THE STRANGEST THING SINCE FICTION! BLESSINGS ON EACH OF YOU WHO TRIED - WHO CAME BY AND READ THIS POSTING. IT'S BEEN ONE OF THE MOST FUN BLOG POSTINGS I'VE EVER DONE - THANK YOU MARY FOR GIVING US SUCH A BOOST THIS WEEK! Y'ALL COME BACK NOW - YA HEAR?